Calvin Hedley has a unique challenge for a writer – he’s blind. And here’s his story about writing and publishing Turning-Point. Calvin was introduced to me by Douglas Burcham, the author of a uniquely named book YWNWAB – which stands for You Will Never Write A Book – the comment Douglas’s friends made when he told them about his passion for writing. I’m delighted to host Calvin on the blog today. Mary Tod has kindly extended this opportunity for me to introduce myself and my writing, which reflects a fascination I have with history. I strive not only to establish a sense of time in my work — an indispensible part of setting — but I also rely on my characters to drive the plot. Events can be tragic, exciting, horrific, unexpected, unpredictable, — you name it! But characters can be all of these things at one and the same instant. Given this, they prove for me by far the most interesting aspect of a story. People’s views differ of course, but in my opinion, the best films and novels are character-driven — after all, one huge fiery explosion is much like the next. I’ve been interested in creative writing for many years and have had some publishing and competition success. Most recently, I managed to gain a runner’s-up spot in an Internet competition, for example, which was presumably open to inhabitants of the universe and beyond. However, I concentrate mainly on novel-writing these days, and my first completed novel, Turning-Point, is now released on Kindle and CreateSpace. I’ve begun a second novel with the working title of Zigzag, and I am putting together an anthology of short stories entitled Penumbra, and am developing other projects too, including tentative ideas re a follow-up to Turning-Point and an introductory, jargon-free guide to punctuation. So, hopefully that’ll keep me off the streets for a year or two. Writers employ many different methods when working; there’s no ‘correct’ process that suits everyone. In short, what works for each individual is right. As a blind author with no sight at all, the same rule applies to me. Obviously, pen and paper are not appropriate, nor do I use a Dictaphone or other recording device much. I overwhelmingly depend on special screen-reader software that ‘reads’ screen activity as it occurs on my computer system. This verbal feedback allows me to type, read, reread, edit, and organise my work. Indeed, somewhat perversely, the screen-reader’s proven to be a very accurate proofreader, as a sentence that sounds wrong usually is wrong in one way or another. I suppose one of the most famous users of audible computer feedback is Stephen Hawking, who, you’ll be astounded to read, is a good deal cleverer than I am. So, through using keystrokes and touch-typing, I can run at around 80 words a minute once I’ve got a head of steam up, and some of the words actually make sense too, which is a bonus. I’m less proficient on the Net than within the confines of Microsoft Office — to be frank, I’m a complete cyber infant! — but the screen-reader nevertheless enables me to carry out virtually all my research, and it can work with some CD-ROM applications too. I did find the involved process of turning a Word file into an e-book entirely beyond my capacity, but with help from Tony Riches and Douglas Burcham, the journey’s now complete, and I offer them my very grateful thanks. 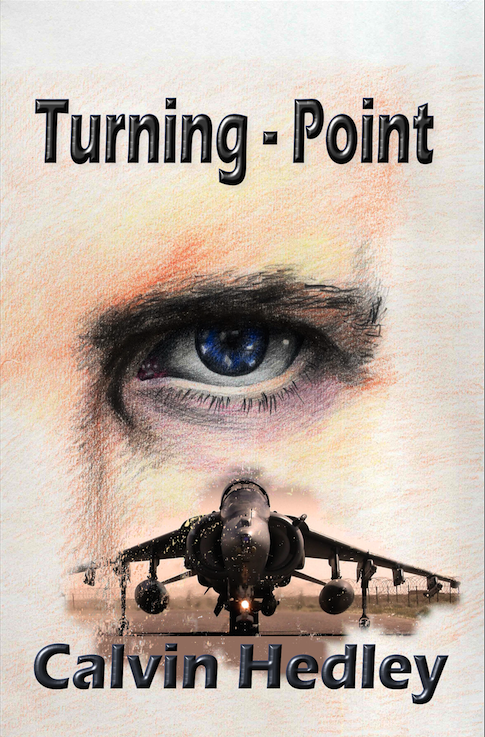 Turning-Point is a split-time mystery thriller. The plot concerns the unexplained disappearance of an RAF pilot in 1979. Investigations, conducted against the backdrops of the Battle of Britain in 1940 and the Falklands Crisis in 1982, piece together for the reader a temporal jigsaw that includes British and German wartime intelligence agencies, high politics in the Reich and Britain, war policy on both sides of the Channel, assassinations, and more. Much of the intrigue is sparked by a photo depicting a seemingly impossible image, which is delivered in 1982 by a complete stranger who is a mystery in himself. But after more than four decades, why is MI5 still interested? What can a grieving father and daughter achieve for a missing son and brother, and can they gain ‘closure’? And what tantalising possibilities does the mystery still offer for Britain in the future? Thank you very much for reading this article, and I offer many, many thanks to Mary for generously donating this blog space. Thanks go to you, Calvin for your interesting perspective on writing and for telling us about Turning-Point, which sounds very intriguing. I wish you much success. A post from Mary Tod that certainly gave me a virtual kick up the proverbial…I was moaning to myself about some technical malfunction that actually was more my fault (a bad workman…) anyway this article puts that into perspective – Calvin Hedley is blind and handles much more sophisticated technology then most of us encounter and has published what looks like a terrific read. No more complaining from me… this week anyway.